It’s October, and that means Tanner is just around the corner (one week away, to be exact)! If you are presenting at Tanner, you are probably getting ready to wow the Wellesley community with all the great things you learned during your internship, study-abroad program, research, or civic engagement. As you prepare your presentation, check out these helpful tips straight from the people who make Tanner possible. ...and get free advice from your Wellesley classmates who have already been there and done that. Before you go. Here are a few things you have to know. If you have been to this conference before, you might remember these programs. This year, the whole conference program is exclusively digital. 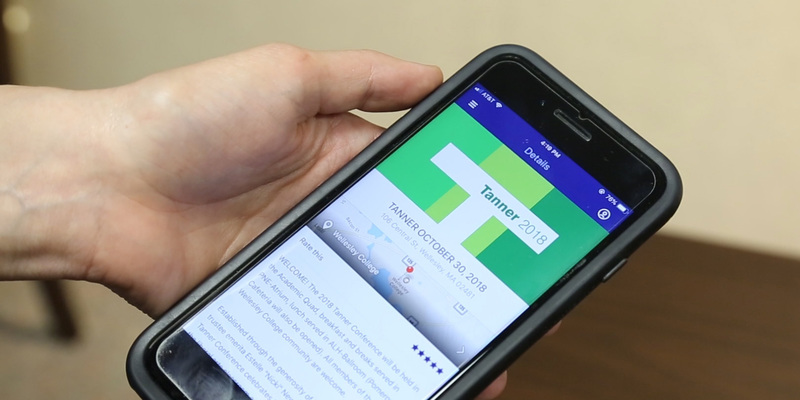 You can view the Tanner Guidebook or download the Wellesley Guidebook app and find the presentations that interest you most, schedule your day, and check out the list of advisers and presenters. Unsure about how to use the guidebook? Tech support will be on hand to help you navigate this platform in the Pendleton East check-in area during the first half of the day. No more plastic water bottles! Be sure to bring a reusable one. Tanner and Career Education are teaming up to make sure you have support before and after you find that perfect internship. TANNER HAS A NEW WEBSITE! Want to know more about what Tanner is all about and how it can help you figure out your next move? Check out the conference’s new website. The 2018 Tanner Conference will be held in the Academic Quad. Breakfast and breaks will be in PNE-Atrium. Lunch will be served in ALH-Ballroom (Pomeroy Cafeteria will also be open). All members of the Wellesley College community are welcome! Feeling inspired? Meet campus representatives during lunch or visit Career Education’s website to make an appointment to learn more about experiential learning opportunities.